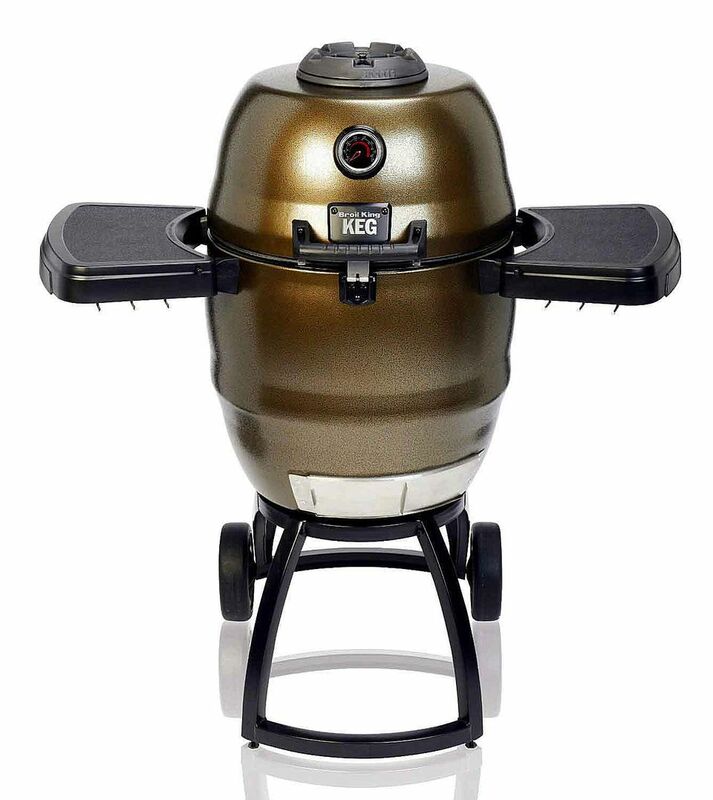 The Broil King Keg is so closely modeled on the size and shape of the Big Green Egg that grates and accessories are interchangeable, yet this metal version has some truly impressive innovative features and design. Capable of hitting very high temperatures while staying cool on the outside with great temperature control, this grill really is an amazing unit. You can even mount it onto your trailer hitch and take it tailgating, something you would have trouble doing with similar ceramic kamado cookers. While a great grilling grill there are some small problems with the design that might give you issues. This charcoal grill started out life as the Bubba Keg Charcoal Grill under licensing deal with the people who make those big, plastic and metal drinking cups. After a couple of years, that deal died and the name was changed to the Big Steel Keg. In 2010, Onward Manufacturing of Canada bought that company and changed the name of this grill to the Broil King Steel Keg and then Broil King Keg. During this time, there have been a few changes but by and large, this is the same grill it was when it first hit the market. While the makers of the Broil King Keg call it a convection grill, what it really is, is a kamado cooker. Based on centuries old design, the ceramic Kamado is an incredibly efficient and versatile cooker that not only grills but works great as a smoker. The chief drawback of the ceramic versions (i.e. Big Green Egg) is that they are heavy and awkward to move. The Broil King Keg not only doesn't have this problem but comes standard with a trailer hitch mounting so you can take this grill on the road. The basic construction of the Broil King Steel Keg is two layers of baked enamel steel with a layer of high temperature, oven grade insulation in between. This means that this grill can really hold in the heat. On the test version I was provided (an original Bubba Keg) with, I was able to hold a temperature of 250 degrees 2 hours after I had closed down the lid and snuffed out the fire. The efficiency of this unit means you need a very small amount of charcoal to fire the grill but will still be able to reach temperatures up to 800 degrees F. In fact if you are interested in low and slow barbecue cooking you will have to ration the charcoal even more and keep the vents nearly closed to hold a temperature around 225 degrees F.
Loaded with features from a pair of bottle openers to the numbered vents for easy control this grill is very well thought out and well designed. Broil King has made a number of modifications, eliminating the more obvious problems with this grill. The rivets and many of the metal parts have been replaced with stainless steel, greatly reducing the rusting issues that were evident with earlier versions.